The Kronos is made by Korg, it is a 61 key workstation with touch sensitive keys and an 8 inch full color touch view screen that It is brilliant I must say! But for the price of this board, which is almost 3 grand; it better be a great screen! The price had me very confused because I own Motifs and Fantoms and just about any other high end keyboard/workstation that has come out and I could not figure out why this would cost so much especially with it only being the 61 key version. I would not have a problem paying that price for the full 88 key version of the Kronos. Using the Kronos did take me some time to fully understand because it was completely different from any of the other Korg boards that I have owned. Thankfully the color touch screen makes everything pretty easy to navigate and find what I was looking for. This is the perfect style of keyboard for the series producer who is looking for functionality and great sounds. The sounds are by far the best thing about this workstation. I was completely blown away with the quality of the sounds. This was what made me throw this bad boy on my credit card and take it home that same day! There are just so many possibilities with the sounds on the Kronos and it is pretty simple to mold them the way you want them to sound and adding effects will only make them sound better. There are 9 sound engines on the Kronos and for this price you are getting exactly what you would expect. This workstation is built really well and it has not giving me a single issue since I purchased it last summer. It has 6 audio outputs and 2 inputs. You can sample directly on this workstation and it can most definitely be the brain of your whole production studio. I absolutely love this workstation and now it is the one that I use the most. I have even purchase some expansions for it! This is another one of those boards that comes industry ready right out of the box. It’s extremely easy to get it set up and ready to start making great music. The editing abilities on this board are easy to do and the workstation is easy to navigate. I love the pitch and modulation on this board, works great and is very smooth. The manual is very easy to understand and is concise and in depth. But unfortunately the manual doesn’t come in a printed version. Some of use love to have hard copies of a manual and don’t want to have to pop in a cd just for a reference on something we might need to check or to do. Even with the ease of computers, I still prefer a hard copy of a manual so I can just index what I’m looking for and find it and understand what I need. I don’t like having to find the cd and put it in just for a quick reference. This board comes stock with a lot of sounds that sound great and are very warm and clean. The brass sounds are really realistic in my opinion. I was very surprise with the quality of the brass sounds and presets. The Piano sounds didn’t impress me and weren’t as good as they are on the other boards that are out in the music world today. The just didn’t seem as realistic and warm as I am use to with the Fantom and Motif. Choir and Organ patches are good and unique sounding patches, but nothing that blows other boards out of the water, just very basic sounding patches. Overall this is a very good keyboard, the synths on this board have the weird feel to them, great board for techno or club music. This board is pretty expensive but not as bad as a lot of other professional boards on the market. G.jourdain's review (This content has been automatically translated from French)" it seems all the good"
I bought the X61 kronos replacing my tyros 4.
not comparable course, this is not the same approach. the tyros machine is formidable, but not sufficiently integrated with the DAW. and I need to work with me because I use my sequencer plug in. otherwise I would have kept the tyros. x when the Kronos to him makes me feel like 4 or 5 synths and a sample player. for pianos, I stayed on the buttocks when I in addition bought the bank "pay" Austrian piano "250 euros!". we play on if you want ..; consumes it without asking questions. The manual is in French and very well done. I discovered the kronos. we are in the linux pc. so it is comfortable in the tree when you have a pc. I'll look later all synths to know if it can replace my plug-in ..! sound quickly go to bluffing means. banks plug in sounds are much better. anyway, no hard do I like the sax. but against the piano, especially the piano .. Austrian bank, so there hot friends ... before ... and I've tried everything and heard .. Finally, combinations are interesting and inspiring. I use it for 15 days .., so I do not know the beast. This is a notice to hot start. I think I have tried all models. this one suits me now. we approach the machine to do anything soon, still some effort to do. I would do this choice without problem now. Anonymous 's review (This content has been automatically translated from French)"excellent synth in FINDUS!" The features are those of the most complete workstation market .. nothing to say! The Kronos is sporting a 61 finish and an assembly worthy of a keyboard half the price .. This is not serious for some, the AC is for me! I have not supported the keyboard vibrating like a pot of 61 ... kronos is no fun to play! Eureka .. J had a chance to put the two side by side .. and the assembly of the kronos is not at all at the height of that of the M3 ..
J have therefore included .... question of willingness to enhance the finish of the product or not! The guide parameters of 1200 pages is in English ... and in pdf! A guide for use in french (ridiculous) is available on paper ... videos on a dvd .. then the other provided user guide PDF on a lot! Anyway, if you do not understand the English and that it was not a good technical mastery .. take a kronos will be a little pretentious! While no particular problems .. well those who profit from this synth have the means to control it and are not interfered .. Considering the complexity of the machine, the usability is not so bad .. (in the window of korg ..) after you can also do better in the organization of the pages .. but still c is personal! J had an M3, so I have not been lost because there is continuity. good even when organs ..
Part rompleur is not the height of that of a motive, but it is not so bad must not exaggerate! Synthesis engines do the job they are supposed to do .... it works! The sound of the kronos is very defined, precise and dynamic ..
this makes it a little too slick to my ears ..
J have since taken a 80 roland jupiter, and I prefer 10 times its sounds much warmer .. rated the kronos sounds like a frozen dinner! -I prefer the pianos of those in North ..
-Rhythmic textures trash everything goes: I prefer 10 times my native instruments maschine. As for combis, j has arrived withstand those of M3 which has remained high as a man .. but al listen to combis footprints too full of textures supposed to put it on the chin and unplayable ... j came close to fainting! In short, maybe I&#39;m jaded .. I do not know. No it&#39;s not because we add synthetic engine has everything that was going the best sound! The Kronos looks like a melting pot of the best of home korg "a compilation of 2012"
Except that I prefer machines that finally have a true grain, and it did not really kronos identity endearing .. It is the grain or the kronos? And has a worse time, or playing music, or program it .. but the engine physical modeling and FM REQUIRE same by them for hours of exploration out 1 or 2 sounds ..
After a moment, I can not see the interest! D Also, c is a bit like the DX7, everyone was happy to have al the era, and no one was programming! C is good to have them ... but if it is to spend hours programming a bell FM huuurg 2 balls ...! Well, we&#39;re all different .. If some love get lost in the complexity of a machine is understandable .. c! But hey, everyone sees noon at his door .. and the kronos can definitely satisfy people who want to ca. The problem: vibration and low-end assembly! Home, the marketing guys have taken over product quality. They take a little too geeky for the musicians! The guy from marketings and accountants took over ... and unfortunately they do more pro synths in terms of finish and reliability product! Me, I like the beautiful machines gadjets hardware .. not! When has anyone find me too hard, I tell them "okay guys, buy your kronos"
Soon, thanks to korg will be right if we continue like that ... al obsolescence or keyboard biodegradable within 5 years! Finally all the same, a synth to 3000 euros, this is not a smartphone! D in me anymore ... the spirit of this not my cup of tea! Then personal j ... have nothing to shake that a synth engine has 307 synthetic ... it is not so that it sounds better in a project .. The first thing that interress m is either a beautiful machine solid and well finished, and it sounds! The Kronos does not fulfill all these conditions has clearly ... my eyes! So no reason why I get depressed ... all is well with my machines ... among others! The most surprising, is c&#39;s be honest I have never been so relieved u synth until I got rid of m .. Sometimes I think about ... and I wonder why this was the point! on the other hand, sometimes I miss my M3 is saying ... c! When has my old XF motif, also a little that I miss that .. I have foolishly sold for gadjet! fabert's review (This content has been automatically translated from French)" good but not great"
I spend the characters, visit korg. BMOL, not possible to have it recognized in cubase and sonar while the drivers exist, bizarre, and management as with the M3 in cubase as vst. It is abnormal that today a major manufacturer of such a korg synth without being able to communicate with a Mac or PC. With korg from beginners, delta m1, m3, 05rw, ns5r, Wavestation, MicroX, 2000 ms, triton extreme M3, TR rack, I'm used to the philosophy and sounds korg korg, No surprise. Not open the manual. Korg sounds good in normal trs synthesis and acoustic means, my yamaha is suprieurs. It is only evolution of M3, hence my dception on Kronos. 3 days of intense testing and the habit of synth since 1976. 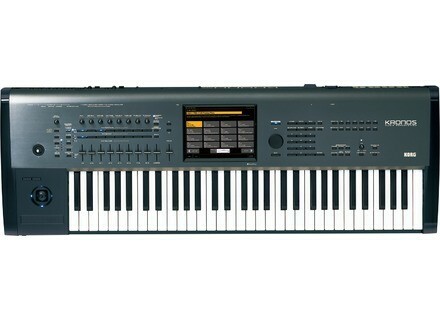 Whereas I though the Roland Fantom G7 suprieur but equivalent to yamaha XF6. The report quality price is a bit expensive in terms of M3. petitsynthe's review (This content has been automatically translated from French)" A giant step!" Touch is very nice, well above my old Korg M-50 but of course it's not the same range and it feels. This workstation is it easy to use? yes and no, it depends on the use that is in fact: if it is to use the presets or load new sounds, yes, if it is to edit, given the number of parameters and "synthesis" , it gets harder and it will spend the time (probably many years to go around, long after the next model came out: it makes you think!). Well, the user manual is complete more than 1000 pages, but for a quick start, I suggest you watch the DVD in French (an hour of video). Thank you again to the large touch screen, which, if it requires some getting used to, is a marvel of ergonomics! - THE ELECTRIC PIANO: it is not my chosen field but again, it sounds great! - THE synth sounds: There have been many analog synths, digital and virtual analog, it sounds the thunder emulations sound cleaner than an analog but in a mix, which will see the difference? .. And then the ground ring hovering death (yes, the Wavestation is in), I think fans, among other "new age music master plans" will be delighted. He'll have much to say about this part ... but I give almost 10 to 10. - Acoustic sounds: contrary to what is said in many forums, there are beautiful sounds or string ensemble of guitars (acoustic or electric), among others. While some sounds based on samples will be playing any more such as brass or saxophones, but they remain available, and then as the OS is open, nothing says that the sound will not improve. Well, it would take a novel to explain that such a class is like this or like that, but overall it's a real treat! PS: I will complete later this comment with regard to the sound of DX7 (a real plus!) And import of Akai banks. Certainly, existing users become "spoiled rotten" or what? Because they are jaded by their VST "free" or have not experienced the big time when it was creating music on machines with 4 or 8 MB of RAM? It was also a little bit of geule I wanted to go after some remarks. Is it better than the Motif XF? yes and no, it's just different, anyway they are two great machines, but just a little different approach (the pattern is just a bit higher for sounds "acoustic") and then the Kronos is a recent year from the Motif. Well, to sum up I give full marks to the Korg Kronos because it suits me 100% and is (almost) perfect for a workstation 2011. I do know that the counselor because it is a real favorite for me, finally, the machine of my dreams, at least what I expected for a long time! Mickamix's review (This content has been automatically translated from French)" compared with a Muse Receptor"
MS20 yet? it can be found also in receptor I think. So $3500 in a keyboard that is eaten by a system "open" a price equivalent I am perplexed. Traditional manufacturers are overwhelmed by the power of the hybrid system. this is a scam. I do not want the keyboard "restrained" by the sample memory and storage.